The common lilac (Syringa vulgaris) is a native of south-east Europe. This is the species most known to the public because it gave birth to many horticultural varieties that inhabit our gardens, its rich and fragrant flowering is greatly appreciated. The Latin name of the plant comes from the Greek syringos which means pipe : twigs are straight, long and filled in the middle of a marrow simulating the hole in a pipe. 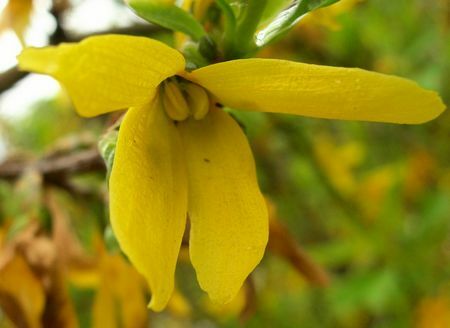 It can be removed easily, which has the common name of English pipe tree. However, there is no indication that the wood of lilac has been used in the manufacture of pipe. The lilacs are small shrubs or trees, deciduous leaves, inflorescences with highly visible (or panicles thyrses) and very fragrant. 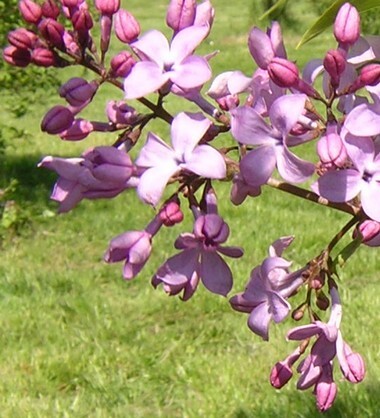 Syringa vulgaris is the most known and gave rise to many cultivars, in particular through the Breeders from Nancy, Lemoine and son, from 1850 to 1955. —— Syringa x hyacinthiflora, an hybrid of species S. oblata x S. vulgaris. Photography : Rolland Genot. ——— The lilacs belong to the family Oleaceae which includes well known plants such as ash tree, olive, forsythia and jasmine. The leaves are opposite as all Oleaceae (except jasmine). They are simple. ——– Flower forsythia. As with botanical Lilac, 4 petals are welded to each other and there are 2 stamens. ——– Like most Oleaceae, petals, number 4, are welded to each other. The stamens are among 2. The ovary is upper (supère=upper ??) and consists of 2 carpels. The placentation is axile. The fruits are berries while they are samares with the ash tree or capsules with the forsythia. No food use is listed for the lilac when it is frequently used and planted for its flowering. In ancient time, lilac was a symbol of love and fertility, it is a plant, in English, premonitory distress formerly used for the funeral ceremonies. A lilac flowers of a white means a profound love lasting and true; less pure color reflects a relationship in jeopardy.